Throughout his life, Fr. Ciszek touched the lives of many, many people - family, friends and everyone he ministered to. Some have experienced him in group settings, while others have had more personal encounters with this holy man. We invite anyone who has met and been touched by Fr. Walter throughout his extraordinary life to share your stories and memories by submitting them via the form below. Your reminiscences and testimonials will automatically be displayed directly below the form. Message: I got to "know" Fr. Ciszek through his two great books. His profound humility impressed me very much. A few months ago I asked him to pray for my dear aunt, 90, whose kidneys were failing badly. She was in poor shape and decided not to undergo dialysis. We were trying to prepare mentally for her death but I also asked Father to pray for healing of her kidneys. The terrible swelling in her legs is gone, and her kidney function has improved! She is still frail, but we are grateful for all the extra time we have. Thank you, dear Fr. Ciszek, for your powerful intercession. Message: I was fortunate enough to meet and have Fr Ciszek as my confessor while I was a novice nun in Queens NY with The Little Sisters of the poor. For was kind, considerate and very spiritual. It was a privilege to know him. He gave me an ever-deepening love of the Eucharist and my faith. Message: While teaching at West Point in 1972, I invited Fr. Ciczek, who is related to my wife,to lecture to the cadets. He came up from Fordham and gave a fine lecture, after which he spent the night at our home. He then related the following story about an incident during his time in the gulag. After a hard day's work, logging (as I recall he said) I would ladle soup to the workers in their mess. One night, while returning from doing this, a man came up behind me and and put a large blade to my throat, saying 'you give me Communion!' Turning slightly, I recognized the Camp Commander, a man known for his ruthlessness. With the blade at still at my throat, I told him 'go back to your bedroom and get your knees and pray to God to forgive you for the bad things you have done in this camp an your life. Then come back to me tomorrow and I will give you Communion.' The guy then did just a I requested, and I gave him Communion the next day. I have one other story about him from 1964 but am running out of space. Message: I just read the chapter on suffering in "With God in America" and found it so helpful. I always feel better after reading Father Ciszek's writings. It is a resource I can always turn. I hope they canonize Father Ciszek so his hopeful message can reach many others. Message: I have never met Fr. Ciszek, but I got to know him a few years ago through first his book With God in Russia, then He Leadeth Me. His story inspired me to trust God even during the hardships of life. I have experienced Fr. Walter's intercession in a couple ways in my life. I am a rising senior in high school, and this past April I took the ACT. For months beforehand, I said the prayer card to Fr. Walter for his intercession on the test day. After taking the test, I got a score higher than I had expected (even better than my practice tests), and now I know I'll get into the college of my choice (a prestigious university). A little less than two months ago, my grandpa had an emergency admission to the hospital. His health has been frail - to the point of possible death - since September 2017. At the point of this hospital admission, he was 6'2" and weighed less than 90 pounds and couldn't keep any food down. In my desperation because I feared the end was now finally here, I turned to Fr. Walter. Due to his intercession, my grandpa has finally been properly diagnosed with severe celiac disease, and now he weighs more than 120 pounds and he is slowly gaining his strength back. No doubt due to Fr. Walter's intercession, he will return to proper health with, God willing, many more joyful years of life ahead of him. Message: I came to know Fr Ciszek through his books, With God in Russia and He Leadth Me. His message of complete surrender to God's will help me greatly during my most difficult times. Recently I had blood in my urine. One test after another followed. The doctor suspected cancer of the bladder and performed cystoscopy. In the cystoscopy he found tumours that he suspected to be cancerous. Subsequently he performed surgery to remove the tumours and collect samples for biopsy. I prayed to Fr Ciszek for his intercession that I have complete trust in God, wherever or whatever He lead me to. In the frantic anxious periods I had during surgery and waiting for the results of biopsy I find deep peace praying and reading Fr Ciszek's teachings. Finally, the doctor informed me that the tumours were not cancerous. Needless to say I was relieved. But I feel strongly that Fr Ciszek has helped for me. I will always remember his message of letting God lead me. Message: Sadly I never met Fr Ciszek in person. But I have a great devotion to him. In 2016 when I found myself in my 40s and pregnant with my 6th child, I entrusted the pregnancy to him. He was a source of great comfort for me all throughout my pregnancy. My daughter had a very large umbilical hernia that would need surgical repair. I began praying for him to intercede for her & heal the hernia. It has gotten significantly smaller & will most likely not need surgery now. This is not a medical miracle because these types of hernias do often get smaller on their own. But I know he has helped it along the way! He looks out for my little baby girl! Message: I�d been meaning to read With God in Russia for many years, and finally got a copy a few weeks ago. I could not put it down. What impressed me most were his descriptions of feeling depressed and anxious at times, and how he always regained hope with prayer and remembrance of God�s great providence. He became my saint of hope. At the time of my reading, my sister had been suffering with 10 months of crippling knee pain. She had already been through multiple therapies and was awaiting a last effort at surgery. She was very depressed and openly said that she was losing hope. This, more than the pain itself, disturbed her greatly. I silently decided to pray to Fr. 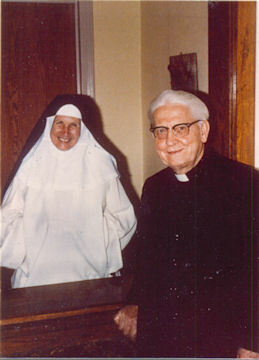 Ciszek for his intercession on her behalf for a restoration of her hope in God. I did this every time she expressed hopelessness. Only once in several weeks did I ever tell her I was praying to Fr. Ciszek. Without exception, within minutes of my silent prayer, she broke out of many periods of dejection and expressed renewed hope. Thank you Fr. Ciszek. Praise God! Message: With God in Russia is a 'required' book for many homeschoolers and my family is no different, though I had never read it myself. This Lent, 2016, I decided to read it as a part of my sacrifices (though it was no sacrifice at all to do so!). Reading it every night was the only promise of Lent I was able to keep. There are too many words from the book that struck my heart, lifted my spirits and reminded me that God is with me always just as He was with Fr. Ciszek. Now, as I go through my busy days I like to remind myself that I am "With God in Maryland"! May he be recognized as a saint by the Church soon! Message: In 1964 our parish, St. Matthews, had invited Father Ciszek to offer a mass in the Eastern Rite. He was residing at Fordum University and I met him in the summer while attending a workshop. The invitation was for him offer an Eastern Rite mass and to speak at a communion breakfast. Our parish is of the Roman Rite. So when it was the weekend for the mass my wife and two children (6 and 4) drove to Fordum to transport him to Stroudsburg. The children and him had a great time during the ride to Stroudsburg. That is fifty years ago and we still recall the experience and stories of the faith of the people he encounter. I still have his letter of his needs for the service and a Holy Card autographed for me when I met him. Message: I did not know this holy priest personally but was very much drawn to him from reading his two deeply inspiring books about his suffering in Russia. Truly, he is probably the most genuinely humble man I have ever encountered. Recently I begged his intercession for a dear elderly aunt of mine who apparently had several small strokes that really changed her personality and activity level. I had little hope of improvement. Through his intercession, a doctor changing a medication helped bring about a big improvement. Thank you, Fr. Ciszek. I hope I can pray to you as "Saint Walter" someday.